There are 3 stages of learning Irish. The first time you have contact with the Irish language, you can’t understand anything, and you think you never will. After you take an introductory course such as Irish for Beginners and you start picking up certain words and phrases while immersing yourself in the Irish language through YouTube pronunciation videos or online radio & TV. When you start learning more intermediate stuff and start to have a conversational level of Irish. When you’re learning Irish Gaelic and you feel overwhelmed, just remember these 3 stages of the Irish learning process, and you’ll get back on track. It’s meant to be hard, but not the hardest thing you’ll do. It’s meant to be a challenge. If you feel you’re not on the right track when learning something new, the best thing to do is to find a community of people learning the same thing and seek their advice. You’ll learn new things from people who are in the same place as you, but also from those who already mastered what you’re trying to achieve. Apply this to your Irish learning process. Join the Bitesize Irish Gaelic community and seek their advice – it’s something we’re also doing so we can improve our online learning tools. This week, we’re talking to Thomas Warning from Washington, D.C., a member of the Bitesize community who embarked on the worthy journey of learning Irish. 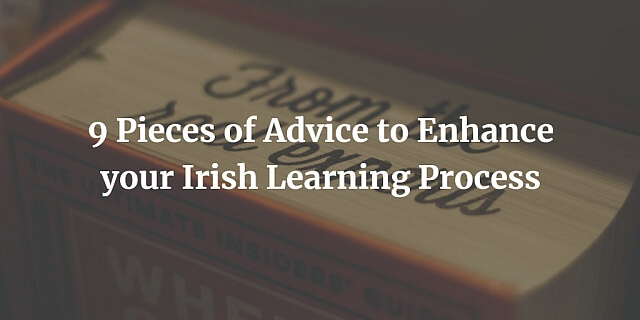 Thomas has 9 pieces of advice that every Irish language learner should go over from time to time to enhance their Irish learning process. We want to thank Thomas for answering our questions and we hope his advice will help others that are in the process of learning Irish. Thomas: I live in Maryland, in America, North of Washington, D.C.
Thomas: I was adopted. For someone who is adopted, some feel as if they are “disconnected” from the tree of humanity. We don’t know our true ancestral background, only the background of our adopted family. We have no sense of roots in the world. A few years ago, after 30+ years of searching, I found my biological mother and got to meet her. I also learned who my biological father was. I also took the genetic test on Ancestry.com. I discovered I was 75% English and 15% Celtic (Scotland, Ireland, Wales (no distinction)). My mother’s maiden name was Dwyer, which is obviously Irish since it is a common derivative of O’Dwyer. I finally knew my part in the ancestry of man and myself. Tracing the Dwyer line of my maternal side has been difficult since many records were destroyed in the past. I decided I wanted to learn the language. What’s to learn about English? Other than slang words and idioms, I already know English, so since the official language of Scotland is English and I couldn’t find any language learning system for Welsh, I chose Irish Gaelic. My great grandfather, as far as I can tell, was born in Ireland and came to America in the mid 19th century. Thomas: I use it mostly as a pastime and hobby. I hope to visit Ireland sometime soon and it would be nice to be able to speak the language to some degree when there. I already speak Spanish and can stumble through Italian, but I’ve learned that Irish is so different from those languages. Since it’s not a Latin-based language (though it has some Latin influenced words), the structure, spelling (ugh, I hate the spelling parts), and pronunciation are vastly different. I started off using Rosetta Stone, but discovered it was only teaching me to “parrot” the language. I had no clue as to sentence structure, no explanations for Eclipses and Lenitions, why words were spelled differently even though they referred to the same thing, such as “car”: I really didn’t know what I was saying. Focus on what you want from the language. The Enhancement Quizzes are great for bolstering your confidence, but can also be a bummer when you miss one, especially the spelling ones. I want to be able to speak and read Irish, later I’ll learn to spell the words correctly. Go back over past lessons to refresh yourself. Find opportunities to speak the language, even if the person to whom you’re speaking has no clue. Speak in Irish and follow up with the English translation. Move at your own pace but don’t go too slow. It takes discipline since you’re the only one who can make or motivate yourself to learn the language. You’re not being graded and you don’t have deadlines for turning in assignments, so it’s all up to you. A sad fact for me, since I’m really good at procrastinating or finding excuses to do something else. If at all possible, find someone in your area or at least your time zone that speaks the language and work with them. Nothing will embed the language in your mind better than speaking and hearing it spoken. This is something I wish I had. Remember, Irish isn’t English. In English we have certain ways of phonetically breaking down a word or phrase into syllables that include specific ways of indicating how those syllables are pronounced. Some Irish phonetic spellings can be confusing, which is why it’s best to pay attention to how the word or phrase is spoken. Put Post-It notes up in a place that you regularly pass, either in your office or at home, with words and phrases (with phonetic pronunciation that works for you) and make a point or reading and pronouncing them as regularly as possible when you pass. Pick words and phrases that you’re likely to use in a day to day conversation. I find phrases, adjectives, and general responses to be best. I don’t focus much of basic vocabulary words like “foot”, “wall”, etc. How often does one talk about their feet in daily conversation? Embrace the language. I love it when a new phrase is presented and then they tell you the “literal” translation (which also helps in learning sentence structure). If you’ve studied or learned a more common foreign language, you’ll realize just how different the Irish language is because it has it’s roots in a vastly different history than the romance or Latin-based languages. Find a smart phone app with dictionary or such. Use it to supplement what you’re learning. But keep in mind, even between apps, how something is pronounced varies. I have chosen to default to the way something is pronounced by those at Bitesize, since, well… they’re Irish. And you know they’re Irish and not some person sitting at a desk writing software or code for an app or program. Want to strengthen the connection to your Irish heritage? Make the first step and sign up for a Bitesize Irish Gaelic membership. Don’t forget about practicing the language, immersing yourself in Irish and visualizing yourself as being fluent. If you want to start slow, that’s also fine – you can always sign up for our free trial! A very good article. I’ve unsuspectingly been doing most of those nine points. 2. I would regularly repeat the lessons, even if I still could not remember how to respond during the interactive ones, figuring I’d eventually remember if repeated often enough. 3. This I’ve been doing for many years, greeting someone in Irish, answering them when they respond in English, and then translating what I just said. One of my long-time customers where I work, caught on early and responds in French. We both have fun with it though neither really knows what the other is saying. 4. Pace has been a problem for me for quite a while. I’ll feel overwhelmed or burned out about the learning process, wait a while and then pick it up again. Similar to hearing a favorite song too many times. 5. This is critical, in my opinion. I was having the hardest time saying where I was from, compared to were I am living, that I couldn’t get it until I heard it from another bowman at my traditional archery practice. That night, I finally got the idea and have tried to do that as often as I can. Still sticks with me to this day. 6. Never was that good a phonetics, so I stick to speaking it for now. I do try guessing how to pronounce road and other signs while I’m here. 7. I’ve been labeling things as I can think to do that, with water bottles, food and the like. 8. New words are cool, and trying to use them in everyday talking is a good idea. 9. Don’t have a smartphone, just a flip. However, the first time I visited Dublin in July, 2012, someone asked who was teaching Irish to me. When I mentioned Eoin and where he lives, the other person (a boy of 14 or so) said “I knew it! I knew I heard a Midlands accent!”. Is that cool, or what? Native speakers are the best. So, what am I doing with Irish language I’ve learned? I’m currently visiting friends in Letterkenny, until the end of October (three months total), and have received many compliments on my Irish speaking. More than once, I’ve heard “You are doing better than many locals I know”, and was one time told “You are more Irish than I am!”. Actually, I’m from near San Diego, California, so I take that as a compliment, too. For background, the traditional family name is o’hArrachtain, from County Galway, according to my grandparents. Eoin, I hope this wasn’t too long, but I felt it would be an encouragement to others struggling to learn Irish. Who knows, you might just be able to actually use it some day!